He was born in Bohemia in 1369, during a time of schism in the Roman Catholic Church—a time of popes, antipopes, and attacks on the church’s hierarchy. Hus received a university education in Prague before being ordained a priest in 1400. He joined other Bohemian reformers who advocated for preaching in the native Czech language rather than Latin, thus allowing every believer more direct access to God. In 1402, Hus was appointed preacher of Bethlehem Chapel, which offered services exclusively in Czech and could accommodate up to three thousand worshipers at a time. For the next eight years, Hus led the Bohemian reform movement from the Bethlehem Chapel pulpit. He taught that the Bible was the source of all truth—not popes or church leaders—writing that, “It is proper to obey God rather than men.” His critiques of the church hierarchy were similar to those leveled by the English reformer John Wycliffe (1331-1384), whose writings had reached Prague after his death. As a university professor and preacher in the 1400s, Hus helped spread Wycliffe’s views in Prague, and he translated some of Wycliffe’s writings into Czech. By the end of the decade, Pope Alexander V (one of three claimants to the papacy) moved to suppress dissent in Bohemia. He ordered Archbishop Zbynek to collect and burn all of Wycliffe’s writings, and he attempted to silence Hus by declaring chapels unfit places for preaching. Hus appealed the order and continued to preach to huge crowds in Prague, his cause backed by many supporters. By July 1410, however, the Archbishop had succeeded in burning over two hundred Wycliffe manuscripts and excommunicating Hus and seven other reformers. Violent opposition met these actions. Buoyed by local support, Hus remained in Prague and continued to criticize what he saw as corruption in the Roman Catholic Church. In 1411, Pope John XXIII, who succeeded Alexander V after his death, ordered the sale of indulgences to support two crusades against the King of Naples, a protector of his rival Pope Gregory XII. Hus attacked both the crusades and the indulgences, which were predicated on the “blasphemous” idea that the pope could offer pardons for sins, a power Hus believed was God’s alone. If the pope used his power in an unscriptural way, Hus wrote, he must be resisted. While Hus’s strong stands and direct attacks on Pope John XXIII garnered much popular support, many of Prague’s academic and religious leaders backed away from his calls for outright defiance. When Pope John issued an interdict banning all religious services in Prague along with a sentence of aggravated excommunication against Hus, the preacher took refuge in the Bohemian countryside, where he continued to write and preach to small outdoor crowds. The last chapter of Jan Hus’s life began with his leaving that refuge. In 1414, King Sigismund, head of the Holy Roman Empire, persuaded Pope John XXIII to call a general council to address the latest schism within the church. 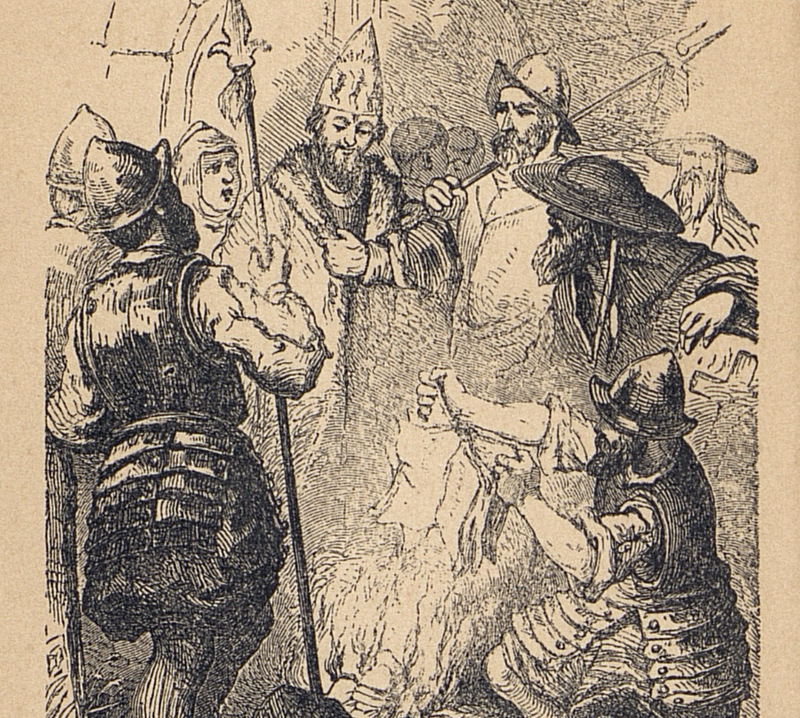 Sigismund offered Jan Hus safe conduct to attend the Council of Constance (1414-1418), and Hus made his way to Germany, eager to express his views before the assembly. Less than a month after his arrival, authorities arrested him on Pope John’s orders. Throughout the ensuing investigation, Hus was not allowed to present his case, and although Pope John fled Constance in 1415, public hearings against Hus began. Months of imprisonment had taken a heavy toll on his health, and yet he attempted to respond to the charges against him—despite shouts and taunts from members of the Council. Hus maintained that he would recant if the Council could instruct him where he had erred according to the Bible, but that he would not concede to any of the 39 articles as presented against him. 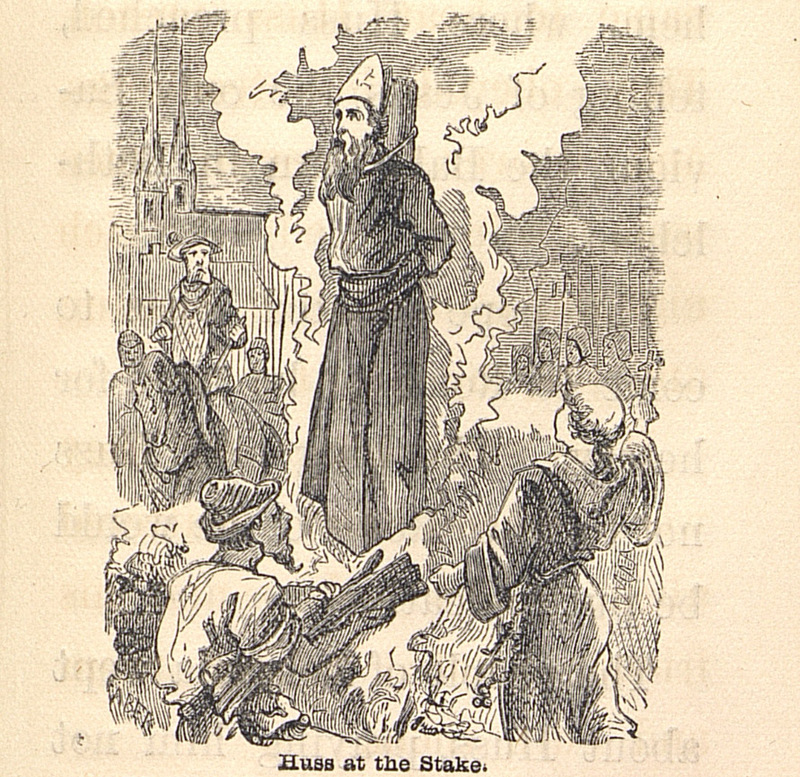 On July 6, 1415, the Council found Jan Hus guilty of heresy and sentenced him to death. Authorities clothed him in clerical garb and gave him a final chance to recant. When he refused, they stripped him of the vestments and placed a tall paper hat on his head, with an inscription that labeled him the leader of a heretical movement. Civil authorities then led him to the execution ground outside the city walls and burned him at the stake. Hus’s death did not silence the calls for reform. While the Council of Constance went on to settle the “Western Schism,” resolving the three-way papacy in favor of Pope Martin V in 1417, the “Hussites” galvanized their efforts against the church authorities whom they believed to be corrupt and immoral. From 1419 to the mid 1430s, the Hussites defeated five papal crusades against them. Martin Luther, widely considered the founder of the Protestant Reformation, paid homage to Jan Hus as his “teacher.” In general, those 16th century reformers—including Luther, Calvin, and Knox—further developed the progressive views first promulgated by Wycliffe, Hus, and their followers. All of the reformers placed a special emphasis on the relationship between lay people and God, moving Christianity away from the Latin liturgy and elaborate church hierarchies of the Middle Ages. Jan Hus died defending his belief that calls for reform were the will of God, even if they challenged the rules of powerful religious men.